In this page-turning memoir, Wittman fascinates with the stories behind his recoveries of priceless art and antiquities: The golden armor of an ancient Peruvian warrior king. The Rodin sculpture that inspired the Impressionist movement. The headdress Geronimo wore at his final Pow-Wow. The rare Civil War battle flag carried into battle by one of the nation’s first African-American regiments. The breadth of Wittman’s exploits is unmatched: He traveled the world to rescue paintings by Rockwell and Rembrandt, Pissarro, Monet and Picasso, often working undercover overseas at the whim of foreign governments. Closer to home, he recovered an original copy of the Bill of Rights and cracked the scam that rocked the PBS series Antiques Roadshow. 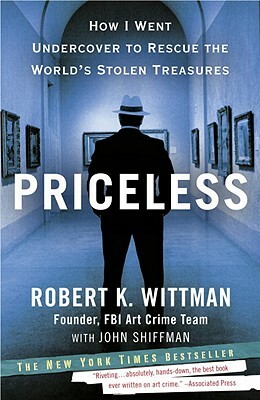 By the FBI’s accounting, Wittman saved hundreds of millions of dollars worth of art and antiquities. He says the statistic isn’t important. After all, who’s to say what is worth more --a Rembrandt self-portrait or an American flag carried into battle? They're both priceless. The art thieves and scammers Wittman caught run the gamut from rich to poor, smart to foolish, organized criminals to desperate loners. The smuggler who brought him a looted 6th-century treasure turned out to be a high-ranking diplomat. The appraiser who stole countless heirlooms from war heroes’ descendants was a slick, aristocratic con man. The museum janitor who made off with locks of George Washington's hair just wanted to make a few extra bucks, figuring no one would miss what he’d filched. ROBERT K. WITTMAN spent twenty years as an FBI special agent. He created and was senior investigator for the bureau’s Art Crime Team. Today, he is president of the international art security firm Robert Wittman Inc.
JOHN SHIFFMAN is an investigative reporter at The Philadelphia Inquirer. He has won numerous writing awards and was a 2009 finalist for the Pulitzer Prize.